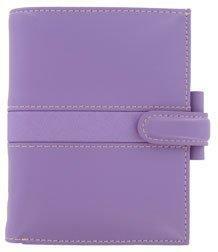 The Piazza Violet Organizer is the ultimate in fashion! It displays a beautiful leather with a suede inlay that is enhanced with a subtle contrast stitching and lining. Left: Two cut edge credit card pockets with a full length pocket behind. Right: One full length zippered pocket and a pen loop. Exterior: Full width wallet pocket. Mini Size Organizer: 4 5/8 X 3 5/8 with five 1/2 rings.